After years of homeschooling, Maggie is starting high school. It’s pretty terrifying. Maggie’s big brothers are there to watch her back, but ever since Mom left it just hasn’t been the same. Besides her brothers, Maggie’s never had any real friends before. Lucy and Alistair don’t have lots of friends either. But they eat lunch with her at school and bring her along on their small-town adventures. Missing mothers…distant brothers…high school…new friends… It’s a lot to deal with. But there’s just one more thing. – Lucy. She’s the perfect supporting character. Nerdy, derpy, very funny, and cool in all the right wrong ways. I love her. – This story doesn’t downplay the hardships of high school. These can be defining years of one’s life, and the situations and treatment one experiences in those years can play a large part in who we become in adult life. – The realism of the interactions between the characters. Nothing felt like story dialogue. – The very subtle m/m romance. Nicely done. – The ghost story aspect. I’m not against there being supernatural elements to a story, but I’m not sure this one really worked. I think the ghost was meant to be a representation of Maggie’s missing mother. The problem is, Maggie never really connected with the ghost in that way. That whole subplot just felt a little underwhelming. – The twins Zander and Lloyd. They bicker a lot and fist fight a lot and quite frankly, it just irritated me. I think they were meant to be fun, comedy characters, but I didn’t feel it. Originally a webcomic, this story is now published by First Second. 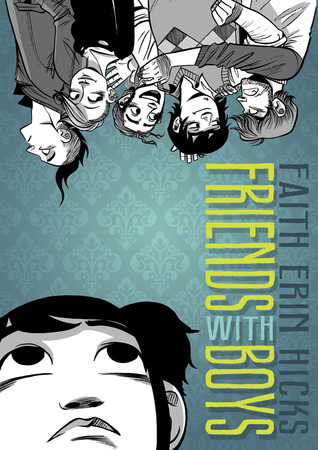 I really like First Second, I think they publish some wonderful coming of age graphic novels. Friends With Boys quickly became one of my favourites. This is Maggie’s first day at high school, and her first time in any school (she was homeschooled previously). So she is understandably overwhelmed. Now, look at how everyone around her are shaded in grey, yet she is clean and stands out. One reason for this is to drive the eye to the character, but it also represents that she is feeling alone and isolated and out of her depth. In the next panel we get a close up of her face, but this time she is greyed out. It leads us, as the reader, to follow Maggie as she enters a state of introversion. We then go in to a flashback. It’s easy to follow what is happening because the art directs our reading. It’s a very smart way of storytelling and something we need much more of in graphic novels and comics. There are also many subtle aspects of the story that are told through the art. Such as little things that happen in the background of a shot. Again, it’s smart. I really liked this. Although, on the odd occasion, those subtleties were then reinforced or explained through dialogue and I would have enjoyed it more if that wasn’t the case. Readers are not stupid and we don’t need every little thing to be explicitly described or explained to us. This story explores themes of change, growing up, and trying to find your tribe. Maggie is new to school, to being around that many people, and essentially to just being friends with anyone else other than her brothers. It also explores finding who we are as a person and who we want to be. I was a little concerned at one point that the story wasn’t really going anywhere. But then things pick up at around the 40% mark. Still, the plot felt a little shallow in parts. This is more of a story of the characters, rather than there being a plot of twists and turns and an established end goal. Overall, I really enjoyed this. It is probably a book that I will read again in the future. There are enough emotional peaks and troughs that I felt engaged and invested in the story throughout. It’s funny in parts, heartbreaking in others. Well worth a read. Anyway, I’m off to listen to some Patti Smith. Until next time, Peace and Love! I need some new GNs to pick up! This is not a sequel or spin of is it by chance? I saw another involving a ghost with very similar artwork (cannot think of the name). So the story never truly clarifies of the ghost of her mother? I like the monochrome style. Blackhole was the same, and I loved it. Great review! Are you thinking of Anya’s Ghost? I reviewed it the other day. They are both published by :01 and I think it’s the same person that did the cover designs for both books, but they are different stories by different creators. The ghost in the story is not her mother. From what I can tell, her mother is alive, she has just left the family. I think the ghost was just supposed to represent that lost mother figure. But it didn’t really work in that sense, unfortunately. Ah I bet that is exactly what I was thinking of! Thanks. I could not peg the name haha but knew I just read it (and on your site – embarrassed) Brain fog will be the mlm death of me. It sounds like this would have been more successful had the lost mother representation came together properly. This was my first FEH’s book and I loved it! I wish there was a sequel to this story.